One of the best things your children needs when they play at home would be a train or activity table. The idea of the table is to provide kid’s with a secure are where they can play with their toy or train set in a comfortable position. The table also keeps all the parts and pieces in one place, especially the ones with a storage unit. 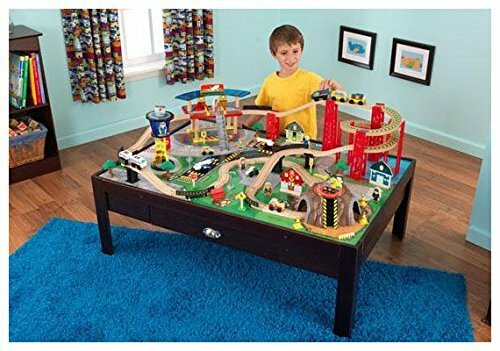 A nice table with that feature would be the Kidkraft Train Table with drawer. The table can also be used for other activities and purposes such as doing homework, engaging on arts and crafts, play-board area and more. The company, KidKraft, has been have been manufacturing and continues to innovate with their creations since the early 1968. They are known to craft children’s toy, gift items, souvenirs and furniture for almost 50 years. The brand just does not come with the name but also with quality in every piece of their creations. A KidKraft product ensures long lasting products made from high quality materials. 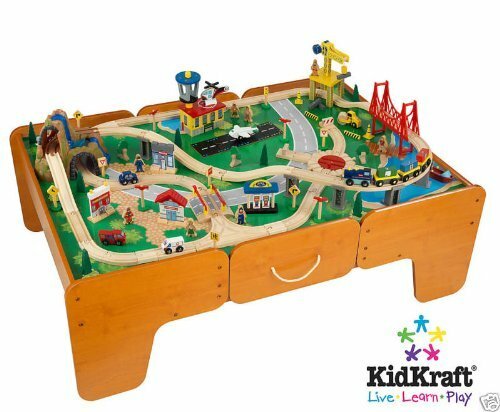 Below is some of the best Kidkraft Train Table that comes with a fair size drawer. This is a Limited Edition train table and set with drawer. The table features 2 drawers, one on each side with a wide space to where you can easily store your train pieces. It also comes with a ready-to-play set of about 120 pieces, complete with tracks, figures, train cars, structures, bridges and buildings. The table also has a play board with a nice green landscape design. This table can be played by 3 to 4 people. Next is a nice honey table that features the well-known Metropolis Train Set by Kidkraft. The table has a large and wide drawer on one side. The drawer is much wider compared to most train or activity tables as it consumes almost the whole area underneath the table. 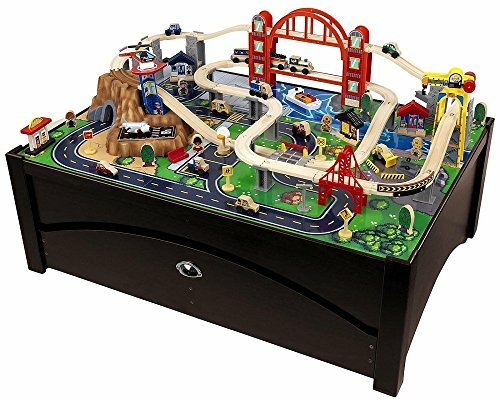 This is a bundle table set that comes with 100 train pieces and accessories. It has a nice honey finish built from solid wood construction. The video actually shows the size of the table and size and it wouldn’t disappoint you. It provides a wide space of play area and large drawers for storage. Another Metropolis train set and table bundle from KidKraft. The table and set is the same as the previous set from Kidkraft but differs in color and finish. This table uses an espresso color which makes it look cool and elegant. It also has a wide trundle drawer where it can fit all 100 train pieces and accessory. The Metropolis features a two-tier bridge, mountain tunnel, buildings, figures, trees, signs and more. 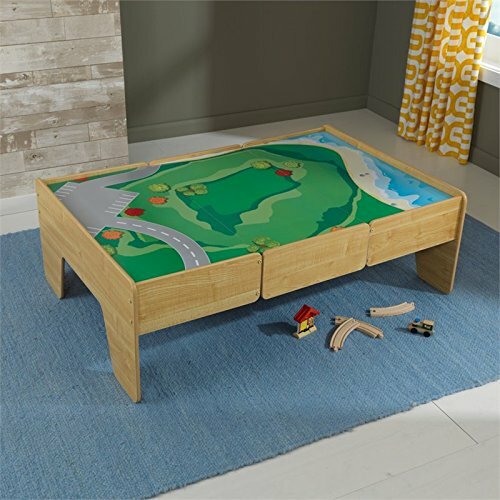 This wooden play table from Kidkraft is an affordable table set with drawers on the sides. 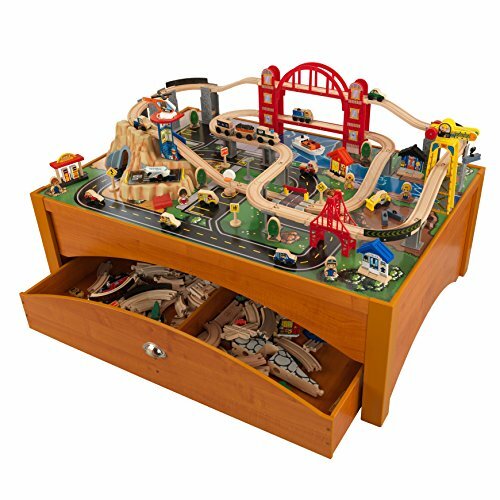 The table has a built-in play board on top which goes perfect for any wooden tracks layout. It has a fairly wide dimension and made with natural finish. It is just one of the few affordable train tables with quality wood work, reliably strong and durable. The next one is the Airport Express Train set and table. The table is among the best Kidkraft train table with drawers at a great and affordable price. It features a small to medium size drawer and a table coated with a nice espresso finish. The bundle includes a train set with at least 100 train pieces. It is complete with necessary accessories such as train cars, train tracks, figures, buildings, bridges, tunnels and more.